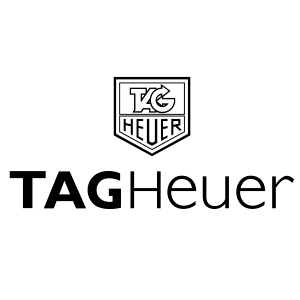 Our workshop features some of the latest tooling and equipment from Rolex, Omega and Tag Heuer. The watch repair workshop also boasts traditional tooling which are no longer manufactured as well as the latest Swiss tooling. 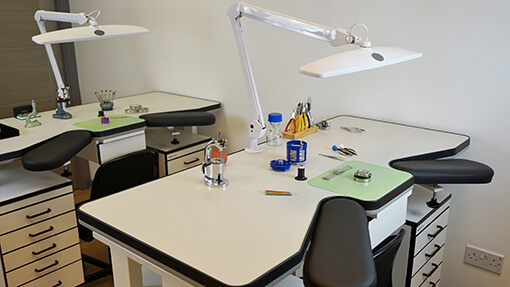 We are proud to show you our workshop where your watch will be serviced and repaired. 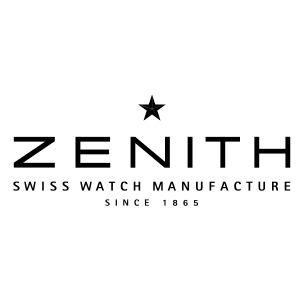 As we are not an internet service agent company that handles watches and posts them off to separate companies, we service and repair all of our watches on site in our fully insured (TH March) watch repair workshop in Lymm, Cheshire. The images on this page and throughout this website are of our tooling and equipment. 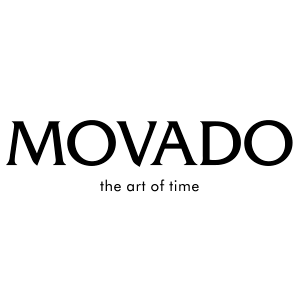 All this makes us stand out from other competitors in watchmaking, servicing and repairing watches. Please take your time and have look at the images and descriptions below. This picture shows a couple of our Swiss watchmakers benches with ergonomic arm rests. These are situated opposite a large window for natural daylight to aid the watchmakers. The drawers are full of all the specialist watchmakers hand tools and branded Swiss movement holders. Our benches also have compressed air and vacuum lines. This is our latest watch movement cleaning machine. 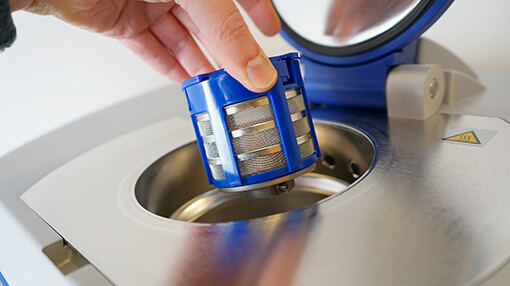 Fully stripped down mechanical and quartz movements go into special baskets to protect the minute parts and then they are placed inside to be cleaned in specialist fluids inside an ultrasonic vacuum chamber. This cleaning machine manufactured by Elma offers phenomenal deep cleaning. A link to a video on how it actually works is here. This is our deep wet pressure tester. 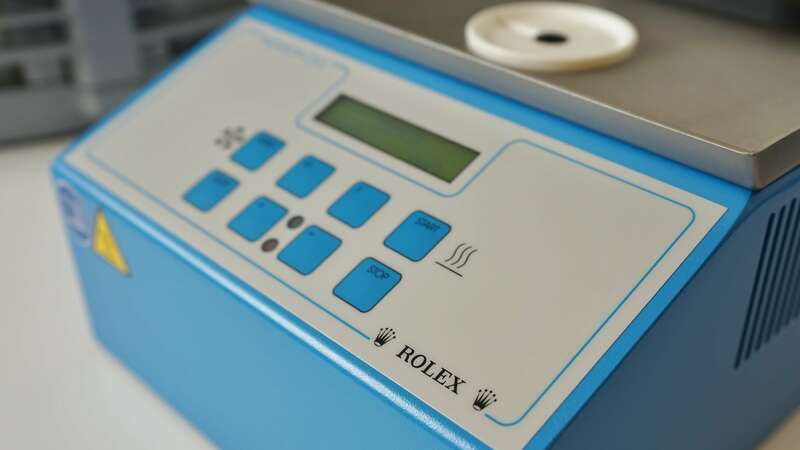 Manufactured by Rolex the WPT1 can pressurise its chamber up to 120 bar (1200 meters). All our Rolex watches in for a service go in here to be tested. 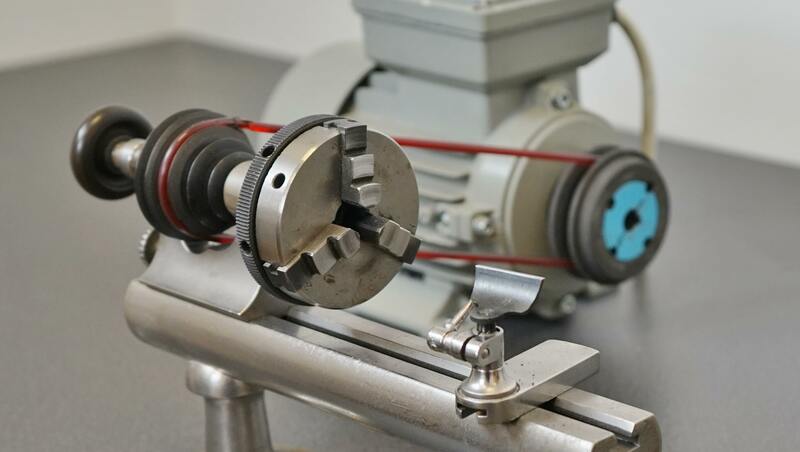 Our watchmakers lathe is used for making and modifying watch parts. It’s also used for refinishing watch cases including case backs and bezels. This traditional lathe has an electronic digital speed controller. Auto-winders simulates the wrist and moves a serviced automatic watch through different positions thus winding up the watch. When the watch is fully wound it’s then placed on a duration test before its ready to be returned to the customer. Our dry vacuum and pressure tester by Sigma SA. 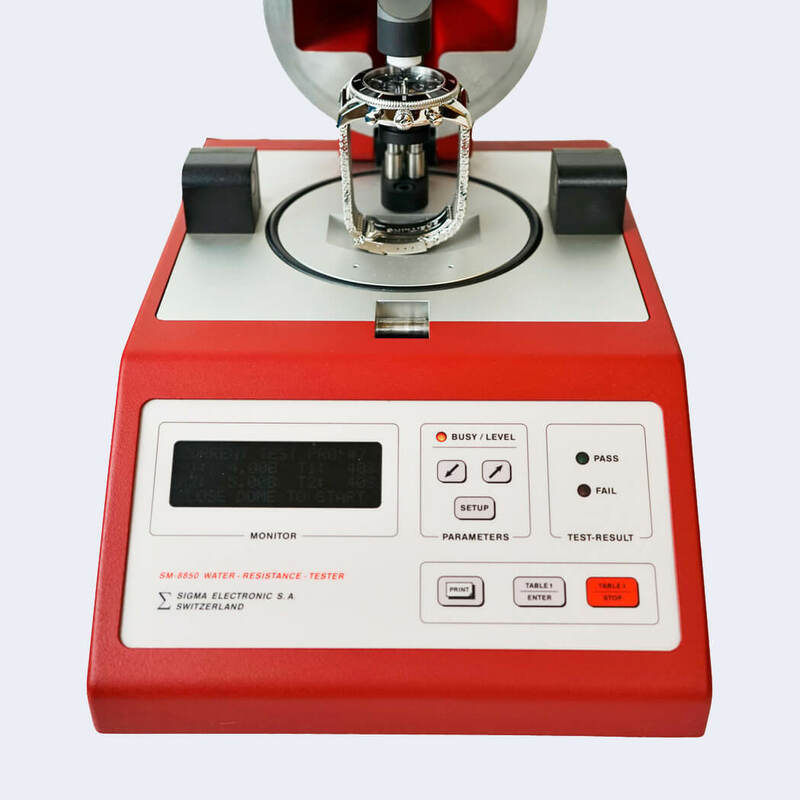 This pressure tester can test up to 30 bar (300 meters) and vacuum test to -0.7 bar. We have programmed in various different test scenarios for each kind of water resistant watch. This wet vacuum tester is great for finding leaks. A watch case is submersed and then a vacuum is created. If the case leaks, a clear trail of bubbles rises to the top. It saves a lot of guessing which gasket might be failing. 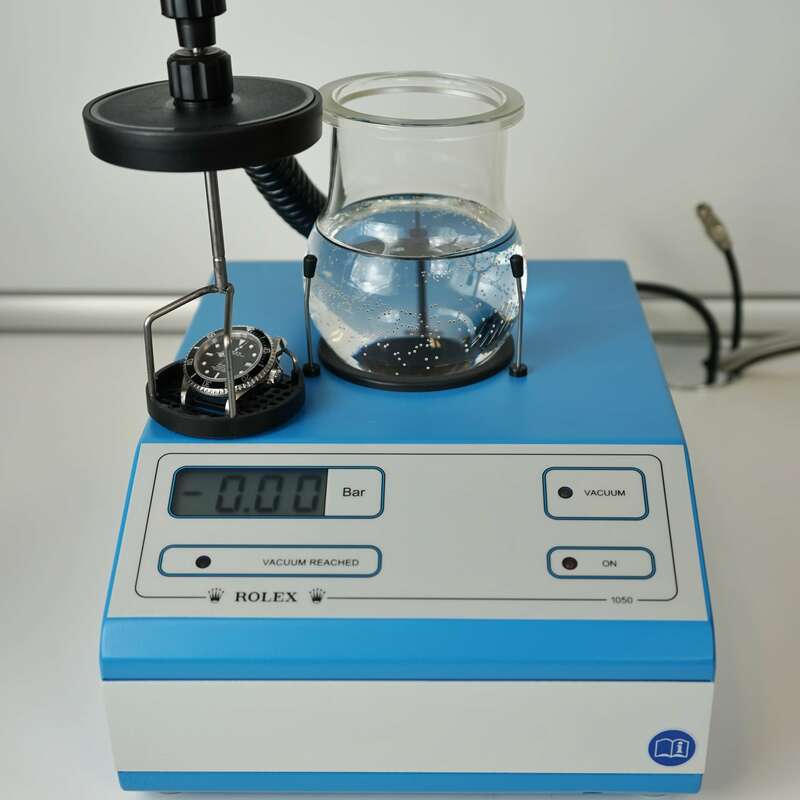 This picture is of our three wet and dry pressure and vacuum testers manufactured by Sigma SA and Rolex. 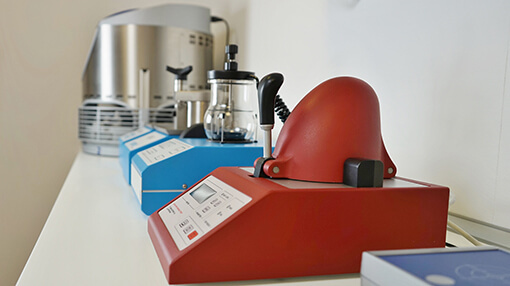 We have a combination of testers to simulate different conditions to test the newly fitted gaskets, crowns, case tubes and glasses after a service and a reseal. We also have a condensation warm/cold shock tester. 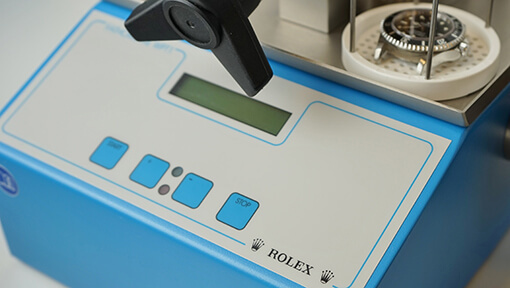 The machine in blue is our condensation shock tester, it’s manufactured by Rolex and features a warm plate and also a cold plate. Watch cases sit on the plates and we look for a condensation build up under the glass to see how well sealed the case is. 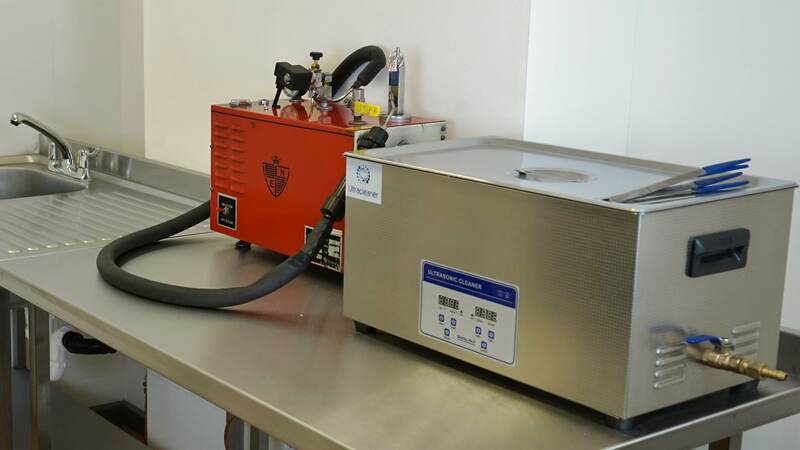 In one of our clean rooms we have our sinks, ultrasonic tanks and our pressurised steamer. 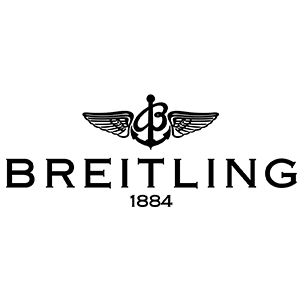 Watch cases and bracelets are washed cleaned in the tanks then steam cleaned to remove and trapped debris. The cases and bracelets come out spotless. 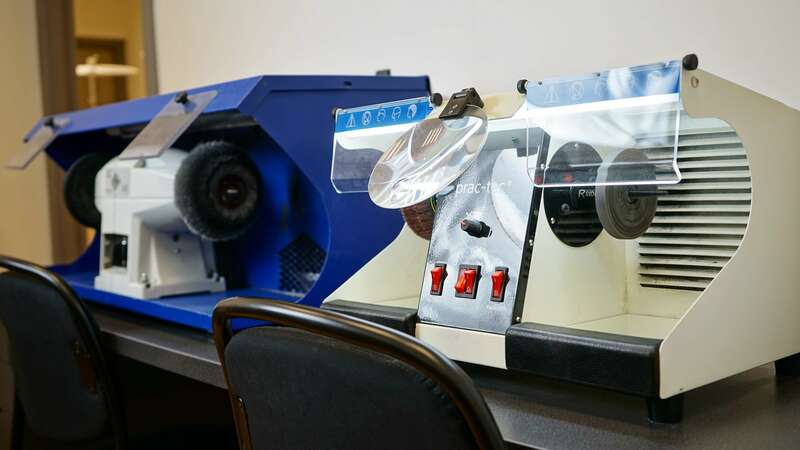 We have quite a few polishing machines set up with different mops for various compounds. We have Manhattan wheels as well as Arti-flex and Bufflex wheels. 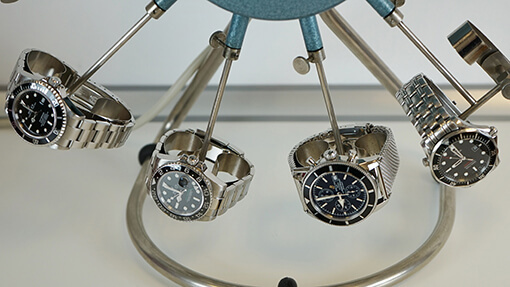 We can polish and re-finish any type of watch case.